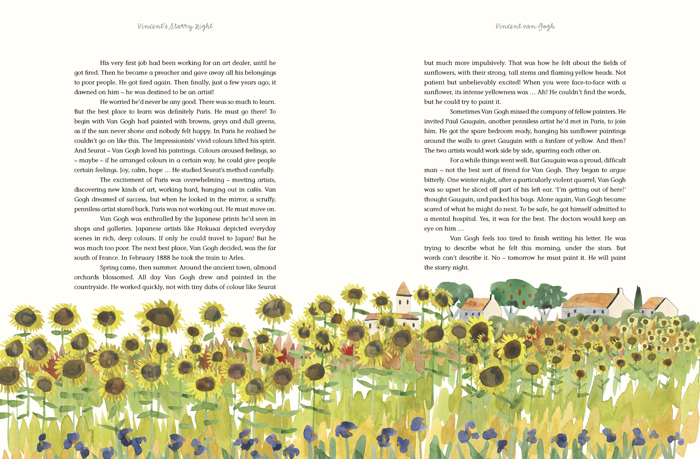 Vincent’s Starry Night and Other Stories is a unique take on art history for children. Significant works of art and movements in art history are enveloped in narrative, which bring to life the context, environment, feel, sights, smells, thought life and dialogue between the artist and his world. Children's senses and imaginations are engaged as the stories help them relate to the artists and their work. It's well known that stories bring us closer to what we're learning, and that's part of what makes this such an exceptional book. Spanning 40,000 years of art history, Vincent’s Starry Night and Other Stories features 68 stories, reproductions of notable artwork, a timeline of historical events and features about the cities and places where artists worked. “I wanted to capture something of the moment of making, the mix of personalities, ideas, materials, ambitions and even crazy accidents that results in art. The stories are all based on historical facts – which of course can be thin on the ground as we go back in time – but I’d like to think they also work as stories in their own right.” — From an interview with author Michael Bird. The book is recommended for ages 9 and up, but probably best presented as a read-aloud or read together with an adult who will be able to provide explanation and insight into the terminology, rare words and abstract concepts presented in the book. Vincent’s Starry Night and Other Stories would serve as an engaging introduction and foundation for further studies in art history. It was authored by art historian Michael Bird and illustrated by Kate Evans. Release date is August 23 from Laurence King Publishing. Laurence King Publishing is giving away a copy of Vincent’s Starry Night and Other Stories. Head over to @averyandaugustine on Instagram to enter. The giveaway ends on Thursday, August 25, 11:00 PM PDT. Images used with permission of Laurence King Publishing.